Pink Cadillac Hybrid Tomato | Henry Field's Seed & Nursery Co. 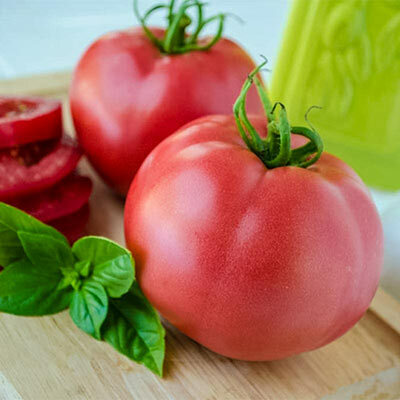 This big, beefy tomato has delectably sweet, mild flavor. Vigorous growth habit and disease resistance make it a garden standout. Bright raspberry-pink, 8- to 10-oz. fruit is lovely on platters, salads and sandwiches. Indeterminate. Disease resistance: VFF. 65 DAYS. Spacing: 36 - 48 inches. Depth: Seed: 1/4 inch deep. When transplanting, set the plant deep, up to the first true leaves, by digging a deep hole or digging a trench. The stem will develop roots along it's length.